I'm having a great time documenting my outfits both for Me Made May and also for the continuation of my work with the Wardrobe Architect. It's wonderful to see how easily me mades and RTW combine. It's great to see how everything truly fits from behind. If you're interested, I'm also posting these images and some other thoughts on Instagram. Outfits worn on days 20, 21, and 22 received significant attention and compliments from friends, coworkers, family, and total strangers! The purple/yellow/green outfit on day 20 was a huge hit at Costco. One woman greeted me gleefully welcoming the color. Likewise, an older man even complimented me on how nice it was to see the color and such a nice style. Wow! I was really surprised and delighted! I've not blogged about making the birch street spiral skirt, but it's definitely a staple. I like that it works both as a 50's style petticoat (adding nice fluff), and also on it's own. I'm so glad I chose the parrot green batik. The skirt is all a bunch of spiral gores. Use a rotary cutter when you make one. Stack up the fabric like you're cutting bits for a quilt. 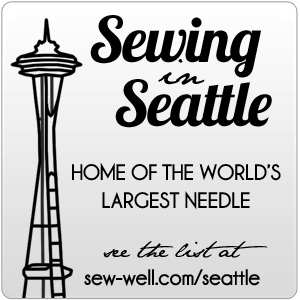 Then, use a serger. The ruffled bits are a little tedious. Serger rolled edge hem cuts the time in half or so. I have one I did in a rayon full length that I wore the heck out of for Bellydancing. Another short version in cotton is on my list of "to makes"! Day 18: Me sized Imke shirt from Sewing Clothes Kids Love done in knits from Girl Charlee (emerald isle which they don't have anymore), Pacific Fabrics (pink remenant), and Marcy Tilton (polk adot mesh). Since I made the dino hat from Ayumi Mills book, Patchwork Please, I've been enamored with her designs. They are so tiny, so fun, so useful. And!!!! They help me use up my scrap bin. Along with the snappy mani wallet Mother's Day present, I decided to make my mom a pillow to hold one of her crystal balls. Most of the ones that we have are small spheres with some slight "imperfections" in them. But, we like those, because usually rainbows appear in the cracks and internal wanderings of the gemstone. The honoring and working with the 4 directions (E, S, W, N) are a sacred part of our spiritual practice. So, in aligning with the intent of a portable altar, I used the pincushion design from "Patchwork Please! ", which has 4 spokes or petals, and created a 4-directions pillow. It's cottonwood season here in the Pacific Northwest. All those fuzzy bits in the photo above are not cat hair, nor are they dandelion seeds. They're cottonwood seeds. It's almost like we have snow in late spring / early summer. Cottonwoods always grow near water and we have several bodies of water (both fresh and saltwater), including one that runs off Mount Rainier. So the cottonwoods like it here. Instead of squaring off the petal shapes on both ends, I included the points, much like a compass rose. Then, I grabbed left over denim from a Mei Tai Baby Carrier I made for my friend when she had her first kids. It was just sturdy enough for the sides to support the weight of a crystal ball or any gemstone. Because the ball or gemstone will need depth to sit in, I left the fabric covered button out, but did still sew the tuck into the center. I'm tickled with how it turned out. Best part? Mom recognized it as a 4-directions pillow before I even told her what it was. Now that's an aligned design decision, wouldn't you say?